Residents along North Carolina's coast are fighting again to keep oil companies from drilling in nearby waters after the Trump administration recently renewed federal efforts to open the Mid-Atlantic region to oil and gas extraction. 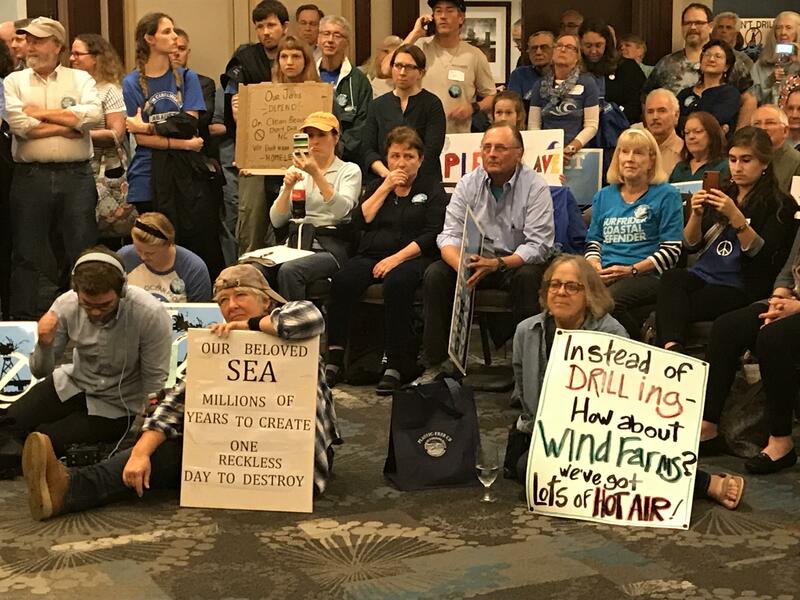 More than 500 people opposed to offshore drilling packed three ballrooms at the Hilton North Raleigh/Midtown Hotel on Monday, Feb. 26, 2018. Opposition to offshore drilling in the state's coastal communities is strong. In the last five years, more than 30 local governments along the state’s coast have passed resolutions against this method of oil and gas extraction. And last week, more than 200 coastal residents traveled on buses to the state capital to rally against renewed efforts to lease federal waters near the state’s coast to fossil fuel companies. Many coastal residents opposed to offshore drilling say it would threaten their local economies, which rely almost exclusively on tourism. Lee Nettles, executive director for the Outer Banks Visitors Bureau, spoke at the rally against offshore drilling on Monday, Feb. 26, 2018. The event coincided with a public meeting, held by the Bureau of Ocean Energy Management, where residents could comment on the federal offshore drilling plan. Joe Ramus serves on the board of directors for the North Carolina Coastal Federation. 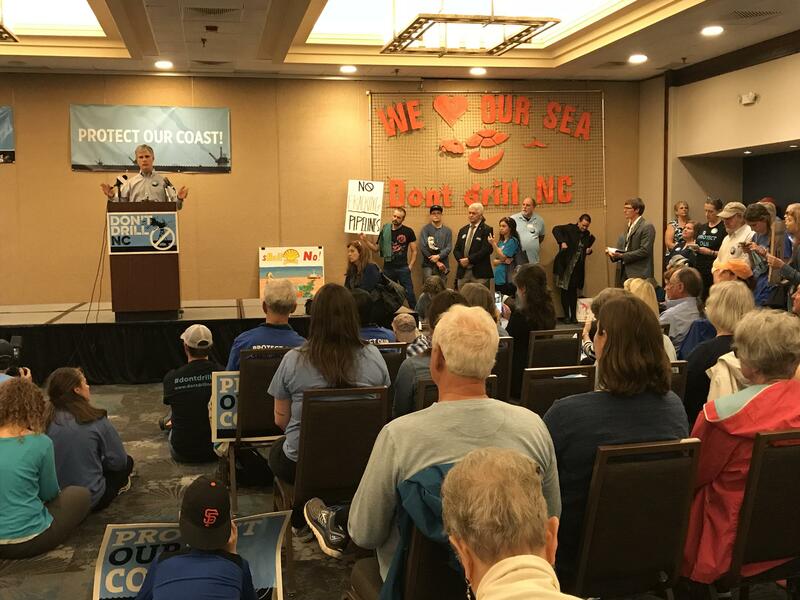 He traveled to the event on a bus with dozens of others from Morehead City to find out more about the federal offshore drilling draft proposal and express opposition at the rally, Ramus said. He’s already submitted an online comment against the plan, he said. Those who couldn’t attend the meeting have until this Friday to submit comments through the agency’s website. Renee Orr, who leads the office of strategic management, says they’re looking for comments that relate to the environment, the economy and the state’s laws, goals and policies. 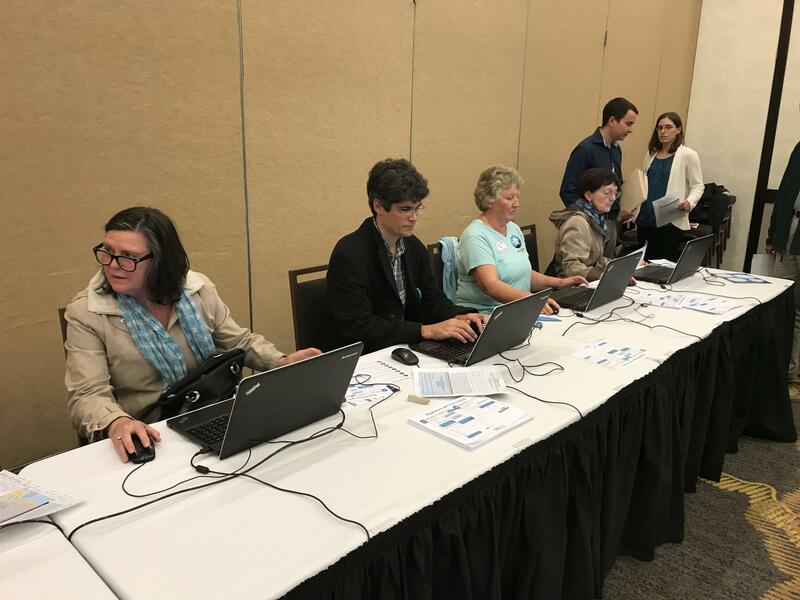 Residents submit comments online at the Bureau of Ocean Energy Management public meeting on Monday, Feb. 26, 2018. The fight against offshore drilling is not new to residents in Coastal North Carolina. Activists there take credit for stopping the Obama administration’s 2015 proposal to open Mid-Atlantic waters to oil and gas developers. But this struggle dates back even further. In 1988, a group called LegaSea formed in Manteo resident Michael McOwen’s living room soon after Outer Banks residents learned of Mobil’s plan to begin drilling in nearby waters. From that point forward, the group spent years educating the community about the risks of offshore drilling, gathering signatures from visitors and residents who were opposed to it and speaking to local, state and federal lawmakers, McOwen said. In 1997, Congress approved a 20-year moratorium on offshore drilling near the state’s coast through the Outer Banks Protection Act. Residents today are expressing opposition at a much earlier stage – before offshore oil and gas leases have been sold. Thirty years ago, Mobil had already purchased the rights to drill before residents began to organize. And today’s resistance is much stronger and more organized than it was when LegaSea started to fight, McOwen said. That’s why he’s optimistic that North Carolina’s fight against offshore drilling will continue to succeed, he said. Since last year, Governor Cooper has taken an active stance against offshore drilling in the Mid-Atlantic. He’s written letters to the Bureau of Ocean Energy Management, held meetings and phone calls with Interior Secretary Ryan Zinke and has traveled to Washington DC to voice opposition. State-level resistance like this helps improve the chances of thwarting the sale of oil and gas leases near the coast, said Sierra Weaver, an attorney with the Southern Environmental Law Center. Governor Cooper has also threatened to sue the federal government if the final oil and gas lease schedule includes the Mid-Atlantic region. The state hasn’t yet revealed its legal strategy, but there are a variety of avenues it could take, Weaver said. “You could imagine the state taking action under the Outer Continental Shelf Lands Act, which governs the leasing process. The National Environmental Policy Act, which requires full considerations of the environmental consequences of an action. You could imagine them considering action under the Endangered Species Act because of the sensitive and vulnerable ecosystems that are at stake in North Carolina,” she said. Even if leases are sold in the Mid-Atlantic, state and local governments can still stop oil companies from drilling by denying permits for onshore infrastructure and enforcing zoning codes, she said. After the public comment period ends on Friday, the Bureau of Ocean Energy Management will begin putting together a draft environmental impact statement and a revised offshore drilling program proposal. Those are expected to come out later this year, followed by a 90-day public comment period. The bureau expects the interior department to approve the final leasing schedule by the end of 2019. If leases are sold, bureau representatives say it could take more than a decade before drilling actually begins in the Atlantic.